Distinctive features: Japanese hand-held electronic calculator sold by the famous U.S. mechanical calculator manufacturer. 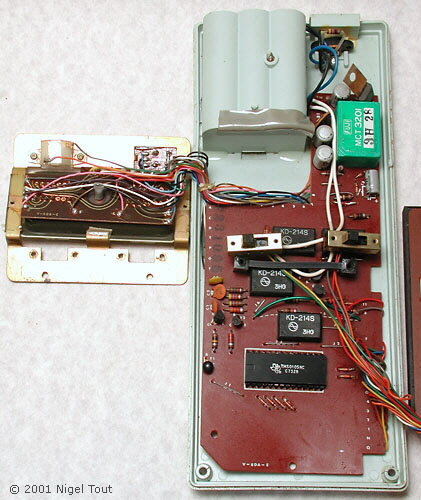 Main integrated circuit - Texas Instruments TMS0105NC, in this example it is date coded week 28 1973. 95 mm x 225 mm x 46 mm (3.75" x 8.9" x 1.8"). Has battery-level meter, on the right above the display. On the left above the display are red LEDs to indicate "Overflow" and "Negative number". The switch on the right has settings at "F-2-3", to set decimal point mode to Floating point, 2, or 3 places of decimals. Made in Japan, for Victor Comptometer Corporation Business Machines Division, Chicago, Illinois. This calculator has a long pedigree from the early days of commercial mechanical calculators. In 1957 the Felt & Tarrant Manufacturing Company, which manufactured the Comptometer, changed its name to the Comptometer Corporation. In 1961 it amalgamated with the equally well established Victor Corporation, which produced mechanical calculators and other office equipment, to form Victor Comptometer Corporation. Victor was a pioneer in the development of integrated circuits for electronic calculators in the mid 1960s but was hit by production problems at its semiconductor sub-contractor. 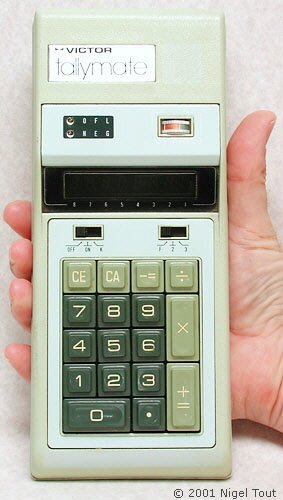 A range of electronic calculators was produced, but latterly most were made in Japan. Victor is still in business and still sells desktop calculators. This calculator is a bit of a handful for its year of manufacture.